No one wants to know about conspiracy any more! Twenty-seven seconds. The wind, thumping, a heartbeat, panting, screams, a bang, swerving, a crash, the back and forth of a VU meter registering it all. Twenty-seven seconds is all it takes and all you get before Designer Richard Greenberg's typography engulfs the lot and you're into Blow Out. John Travolta as Jack Terry, B-movie sound man, is featured in a split-screen sequence, listening to the news as he sorts through noise. His careful process, cutting and labeling reels of sound effects, is juxtaposed with a news broadcast, dividing our attention to establish both the context of the film and the main character. The bright yellow credits carry this introduction forward until coming to a close with Writer–Director Brian De Palma's own name and a door labelled Personal Effects. Title Designer RICHARD GREENBERG speaks about his work on Blow Out in this excerpt from the feature article R/Greenberg Associates: A Film Title Retrospective. 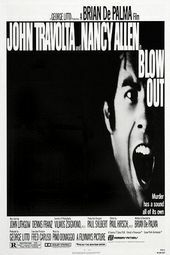 What about Blow Out, from 1981? That movie is very connected with the idea of sound and visuals because of Travolta's character. Richard: That was an interesting one. I had presented lots of stuff to Brian De Palma who was cutting the movie somewhere near our studio. But he didn't like it and I didn't really like it; we weren’t sold on any of the ideas. It suddenly occurred to me that this movie is about sound, so why not go straight at it and do a graphic version of the VU* meter? I sent Brian something like a straight line with a frame and called him up to explain the idea. He simply said, “Good!” and that's what it became. That's an example of an idea that was very, very hard to find. * A Volume Unit meter or Standard Volume Indicator is a device displaying a representation of the signal level in audio equipment.